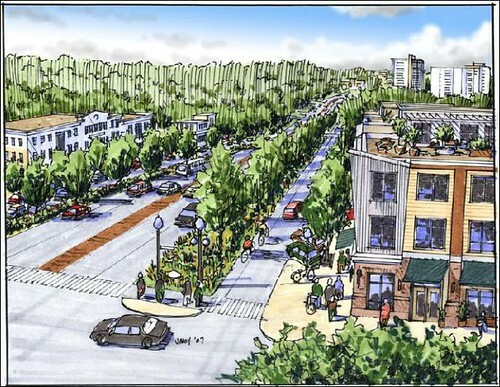 The City of Takoma Park is considering recommendations to turn New Hampshire Avenue into an urban boulevard, shown here in this imagined view of New Hampshire looking north from Sheridan Street. - Colesville's reeling from the theft of one of four "Welcome to Colesville" signs marking the entrance to their community, erected four years ago in an attempt to distinguish them from Colesville Road, which is several miles away. The stolen marker, at East Randolph and Clifton roads, was worth $4,300, though the Greater Colesville Citizens Association, which bought the signs, had them insured. Blaming local teenagers for the incident, resident Fred Pulliam calls it a "sad commentary of the times." 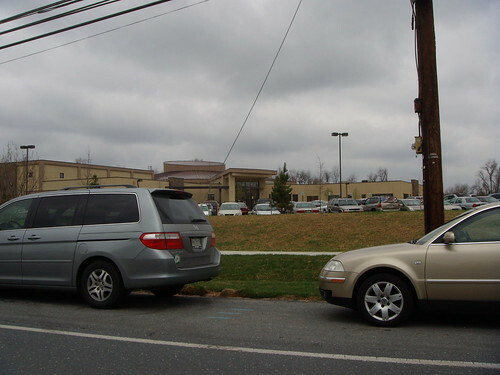 - Citing improved pedestrian access, the City of Takoma Park might slim down New Hampshire Avenue, giving over existing traffic lanes to parking and expanded sidewalks. "We really need to rethink the entire way that we have looked at this road for the past 30 or more years to transform it into a classic urban street, or what we call a multiway boulevard," says planner Stuart Sirota, whose firm was hired to do a design charrette for the city's chunk of New Hampshire last fall. Suggestions included narrowing New Hampshire from six lanes to four, landscaped medians, and a roundabout at Eastern Avenue. City Councilman Reuben Snipper, a bicyclist, complained that the proposal didn't include lanes for bikes or the rapid bus lines that could eventuallly run up New Hampshire. The Lutheran Church of St. Andrew, one of many churches along New Hampshire Avenue in Cloverly, dubbed the "Highway To Heaven." - New Hampshire may be known for its megachurches, but many are raising concerns about churches run out of private homes along the corridor. Reporter Amber Parcher - whose by-lines probably cover half of the Gazette not already given over to ads - interviews residents who say they churches don't belong in residential neighborhoods, citing increased traffic and yards paved over for parking. While I'm not a fan of most house-to-church conversions, having lived next to a split-level-turned-Korean-congregation that eventually closed, I'm curious why small, appropriately planned houses of worship should be banished from residential areas. After all, they do provide important services for the community, and at a scale that doesn't have to overwhelm local roads with cars. Megachurches do as well, but at the expense of eating up undeveloped land and creating a far worse traffic situation than smaller facilities. In fact, many churches buy land on New Hampshire Avenue because they're unable to find suitable locations closer in. This is partially an issue of size; I'm not saying we should let megachurches open up in residential neighborhoods, but smaller houses of worship shouldn't be as limited in where they locate. Absolutely brilliant. This area of Takoma Park/DC desperately needs this kind of re-development to offer residents of that side of town the same conveniences of those who live on the other spokes of the wheel: Connecticut Ave & Wisconsin Ave. They don't need Neiman Marcus, but vibrant mixed-use communities. Go Takoma. Remarking on Dan's comments about in-home churches, I should mention in passing that one of the hallmarks of the Old Order Amish is that they generally don't have an official church, though they probably have a common hall or a meeting house. Church services are commonly conducted in someone's home. I seem to recall that the reasoning was more or less along the lines of "if Jesus can condemn the Pharisees for their public demonstrations of faith, to make a big production out of everyone getting together in an ostentatious dedicated church-building could receive the same condemnation". To require people to worship only in a government-approved facility cuts right across the First Amendment, of course. In Montgomery County, that isn't likely to meet with much public approval. Indeed, I have to admire the sensitivity of the County police who have thus far resisted calls to have me hauled off to jail for having the audacity to worship my creator as I see fit in my own backyard. But perhaps it's not just sensitivity, maybe they actually remember the US and Maryland Constitutions. RE: Reducing New Hampshire Avenue from 6 Lames to 4 Lanes??????? If you and the individual that wrote the story ever traveled on New Hampshire Avenue during Rush Hour and Weekends(definately on good sunny days), you would know that the road is very busy with traffic. Currently New Hampshire Avenue through Langley Park is Temporarly cut down to 4 Lanes due to Construction and it takes Roughly 5 Light Cycles to get through University Boulevard during Rush Hour and Weekends. What makes you think that Narrowing New Hampshire Avenue to 4 Lanes would improve Traffic Conditions on the road. I Strongly Predict that if the SHA is Dumb enough to waste $Millions to shorten New Hampshire Avenue to 4 Lanes it Will Create another US 1/Baltimore Avenue(Between East West Highway and Powder Mill Road in College Park/Beltsville) DISASTER with Major Backups and will dump cars onto side streets. You say that we need to rethink the way the state build its roads but when was the last time the state ever aded extra lanes to a Narrow 2/4 lane Highway that has a History of Traffic Backups such as Riggs/Powder Mill Road(Adelphi-Beltsville), US 1/Baltimore Avenue(College Park-Beltsville), East West Highway(Silver Spring-Bethesda), Kenilworth Avenue(Greenbelt-Beltsville), MD 197 Laurel-Bowie Road(Laurel-Bowie), MD 202 Largo Road(Upper Marlboro), MD 115(Gaithersburg-Aspen Hill), and the MD 198-28 Connector. New Hampshire Avenue definately needs to be Re-developed, but adding Density then reducing Traffic Lanes is not good sense of easing traffic it just makes it worst in which it takes away the credibility of Smart Growth(You don't see DC/Arlington Reducing a Heavily Traveled 4 Lane One Way Streets to 2 Lanes). And please don't say that adding more Mass Transit to the Corridor will help because there already 5 Bus Routes that Operate Rapidly 7 days a week along that corridor and even if they come up with some magical trick plan to build a rail line along New Hampshire Avenue it won't make to much of a Difference, Case in Point look at the Red Line that Runs along Rockville Pike/Wisconsin Avenue, Connecticut Avenue, and Georgia Avenue there are still alot of Traffic that fills up those corridors and if the thaught of Reducing Traffic Lanes on those Highway Corridors it will be a traffic disaster. If the Bicyclist(I barely see any and I do travel on New Hampshire Avenue Weekly) wants the SHA to expand the sidewalk to make room for Bicyclist they can do so with out stealing Traffic Lanes from New Hampshire Avenue. Its one thing to Reduce Lanes that isn't Heavily used such as Piney Branch Road and Fenton Street from 4 Lanes to 2 Lanes but its a D*a*mn Big Deal to reduce a Heavily used New Hampshire Avenue from 6 Lanes to 4 Lanes just in the name of Re-Development. RE: They may not need a Neiman Marcus but they can D*a*mn sure use a Macy's or Nordstroms, especially a Nice 16 Screen Movie Theater, and a Multi-Level Hotel wouldn't hurt. New Hampshire is a heavy-traffic road, reducing lanes doesn't make much sense to me. Reducing all of the lanes is part of the ongoing effort to make driving such a hassle as well as such an expense so as to force more people off onto Mass Transit. The State and County both get Federal funding assistance as long as they can increase transit ridership numbers. Also, more businesses along that area will increase tax receipts to both state and county. It's all about applying the squeeze. Besides, if people get sick to death of driving through artificially constricted areas, they'll be more accepting of new high-density construction of mixed-use development, developers get rich and the state and county have higher tax-receipts per acre. For people who do the math but don't care about congestion delaying ambulances and police response, it's a win-win situation. For long-haul commuters headed to and from places barely served by mass transit systems, it's the intentional creation of their own commuting nightmare. For the comparatively few locals, it means a more walkable local shopping district. This is how you play divide-and-conquer, pitting PIMBYs ("please, in my backyard") against much larger and more geographically widespread communities whose legitimate concerns can be dismissed by saying "but you don't actually live here". Come on, now. This isn't about forcing people on buses, it's about providing choice for those who see driving as the only option and making it easier and more convenient for people who don't have the option of driving, which there are quite a few of along this portion of New Hampshire. Note that New Hampshire goes down to four lanes at the District line - and in many places (near Rock Creek Cemetery, at Kennedy Street, in Dupont Circle) is reduced further to two lanes (with parking that can be turned over to traffic during rush hours). Worse comes to worse, we allow parallel parking during the day and open it to traffic during rush hour. They already do that on Colesville in Downtown Silver Spring. And "comparatively few locals?" Any redevelopment here would create a new center for people in Montgomery, Prince George's and Northeast, not just in Takoma Park. There are already quite a few people living here, in everything from single-family homes to high-rise apartments, and they (along with the larger area around it) are starved for higher-quality amenities. I'm worried about congestion on New Hampshire as well, but leaving the road as it is - or widening it, even - won't do anything to solve the problem. Be sure to construct any new buildings along the north side of NH Avenue from the power line's end to the DC line on a platform allowing construction of the I-95 connector freeway/evacuation route. Narrowing an existing arterial as NH Avenue and adding density without the new highway is sheer insanity- especially in this post 911 atmosphere. Here's the link to the route. The highway paralleling the north side of New Hampshire Avenue would be below ground and covered. "A Trip Within The Beltway"
RE: You and I both know that techniques does not work. They reduced Lanes on Queens Chapel Road(Hyattsville/Chillum) and Connecticut Avenue(North Silver Spring) and all it does is either increased Backups or the drivers/commuters use the Back Roads. There is no way you can prove that making driving difficult for motorist would entice them to use Mass Transit. This is definately not New York City and even in New York City/New Jersey/Philadelphia with all of their Rapid Transit Options most of the Main Roadways are still prone to Traffic Backups at any giving time 24/7. The State and County both get Federal funding assistance as long as they can increase transit ridership numbers. Also, more businesses along that area will increase tax receipts to both state and county. It's all about applying the squeeze. Besides, if people get sick to death of driving through artificially constricted areas, they'll be more accepting of new high-density construction of mixed-use development, developers get rich and the state and county have higher tax-receipts per acre. For people who do the math but don't care about congestion delaying ambulances and police response, it's a win-win situation. RE: It won't work successfully in the name of promoting Mix-Use Development. That little town center at PG Plaza was supposed to have included new Office Buildings and a Hotel But all we're seeing is New Condo's, and Small Retail shops going up. There is a story( http://www.gazette.net/stories/08072008/largnew171521_32461.shtml ) about a community Organization in Largo that is very Upset with the county for Failure to Attract office Development near the Largo Metro Station. Instead of the County promoting more Class A Office Development near the Metro Station they're just doing the same ol' Two-Step of Only promoting more Condo/Apartment Housing and Small Scale Retail as if there isn't enough already being built. The only areas that I have seen this so-called Mixed-Use Gimmick work successfully is in Arlington/Alexandria, VA and thats possibly because the High Density Growth was planed far before the planning of expanding Mass Transit services and as far as I know most of the Main Roads that go through Arlington(US 1, US 29,US 50, etc.) remain as 6 Lane Roadways and the one way streets are anywhere between 4-5 Lanes, and there are 3 Subway Lines that zip through those Corridors along with multiple Bus Routes. RE: Its a Hell of alot worse of a Commuting Nightmare to reduce traffic lanes to an already busy roadway that has Several Commuter Bus Routes. Again you don't see DC/Arlington/Alexandria reducing their Busy Street Lanes in the name of promoting Mix Use Development and Mass Transit or else Constatution Avenue and Independence Avenue would have been reduced from the current 8 Lanes a long time ago. RE: There aren't really that many good shopping options to pick from in that little area, in fact most "locals" either go to DTSS, PG Plaza, or DC to do their shopping. RE: Pure BS is more like it, if anyone truely believes that having Traffic Lanes reduced on busy roadways would attract mix use development and increase mass transit(its already increased). The same people that are crazy in the head to support reducing Traffic Lanes on a busy roadways are the same people that d*a*mned Downtown Silver Spring for what it looks like now with alot of Chain Retail Businesses. RE: Providing Options you say? Are you serious when you type this non-sense?????????? There are Bus Routes that run up and down New Hampshire Avenue all times of the Day 7 Days a week and its been that way since the 1970's. If drivers haven't already ditched their cars to utalize Mass Transit, then reducing the lanes on Busy Road ways won't chenge their their minds. Note that New Hampshire goes down to four lanes at the District line - and in many places (near Rock Creek Cemetery, at Kennedy Street, in Dupont Circle) is reduced further to two lanes (with parking that can be turned over to traffic during rush hours). RE: Note that there are SEVERAL 4 Lane Roadways in NW DC to the point that they don't need any 6 Lane Roadways. There aren't many roads near New Hampshire Avenue that are 4-6 Lanes except Riggs Road(for -5 Miles), University Boulevard, and East West Highway(East of New Hampshire Avenue). Keep in mind that MD 410(West of New Hampshire Avenue and East of Georgia Avenue) and Carroll Avenue are Extremely Small 2 Lane Roads that back up very easily during rush hour and there are plenty of Buses that service the two roads and its been like that for over 30 years. Worse comes to worse, we allow parallel parking during the day and open it to traffic during rush hour. They already do that on Colesville in Downtown Silver Spring. RE: What they can do is use one of the lanes as HOV/Bus that only allow cars with 3 or more people. RE: The only way that would be a success is if they build a Shopping Mall with a Macy's and or Nordstroms, along with changing the zome laws to add Multi-Level Class A Office Buildings like in Bethesda-Chevy Chase/Friendship Heights. RE: So basically you want to make the Congestion worst by reducing the traffic lanes, because that Will Be The Recipe for a Traffic Nightmare if they reduce the traffic lanes. On churches: I don't see them as bad things in neighborhoods so long as parking doesn't become an issue. Other than that, the only potential problem I see is door-to-door proselytizing. But that's annoying no matter where the church is located. On NH Av, fix it up. Willinger has the right idea about keeping the PEPCO corridor open for a by-pass or trains (or better yet, a multi-modal transit corridor), but fix the character of that roadway at all costs. The "State" Avenues should be grand boulevards leading into the District, not traffic gutters for commuters to clog. Revitalizing that area can lower the per-capita crime rate, ease traffic, and help tie together the urban fabric between Silver Spring and Hyattsville. Eventually a trolley running between the Takoma-Langley Purple Line station and Fort Totten could make traffic a more viable option, and the residents of this depressed areas get all around better amenities. Murphy is right. An I-95 PEPCO connector could definitely include a WMATA rail spur splitting off from the existing Red Line, whether remaining on NH Avenue or continuing via the PEPCO row. Anonymous is wrong about the area looking like that area in Virgina, as the 1971-73 PEPCO plan was very different than the 1963-63 NCF study and the subsequent 1971 "Mustard" plan that would have replaced the entire area of TP between the rr and pretty much the 1964 NCF alignment, but without the highway. Mr Willinger makes a good point which I had somewhat overlooked. In this post-9/11 environment, we need to keep in mind at all times that it may be necessary to have everyone in town get out of town as fast as possible. Installing chokepoints along major evacuation routes is a little crazy.